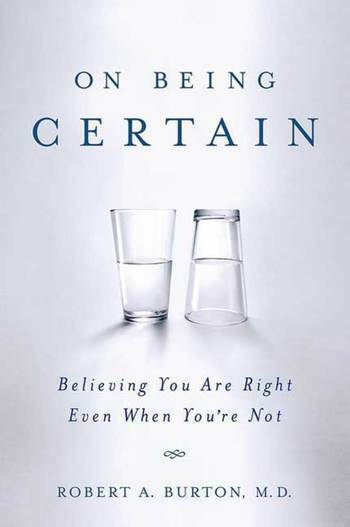 In On Being Certain, neurologist Robert Burton shows that feeling certain—feeling that we know something--- is a mental sensation, rather than evidence of fact. An increasing body of evidence suggests that feelings such as certainty stem from primitive areas of the brain and are independent of active, conscious reflection and reasoning. In other words, the feeling of knowing happens to us; we cannot make it happen. Dr. Robert Burton visits Google's Mountain View, CA headquarters to discuss his book "On Being Certain: Believing You Are Right Even When You're Not." This event took place on June 9, 2008, as part of the Authors@Google series. ROBERT BURTON, M.D. graduated from Yale University and University of California at San Francisco medical school. At age thirty-three, he was appointed chief of the Division of Neurology at Mt. Zion-UCSF Hospital, where he subsequently became Associate Chief of the Department of Neurosciences. His non-neurology writing career includes three critically acclaimed novels. He lives in Sausalito, CA. Macmillan Speakers: Robert A. Burton M.D.